Hi there! Welcome!! Tiffany is someone I recently started following on instagram and the moment I saw her work I wanted to just soak in all her creative inspiration! She’s adorable, her boys are seriously the cutest and I am so excited to have her on the Illustrated Faith creative and education team!!! Please give Tiffany a warm welcome! Hello! I’m Tiffany, a wife and mama enjoying life in Nashville, TN with my amazing husband and two little boys. 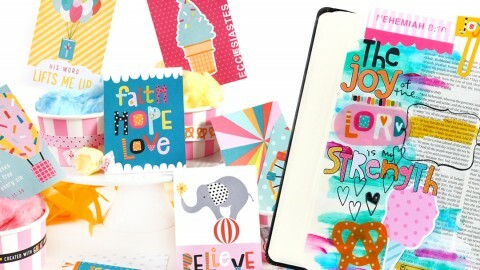 I’m an enthusiast of all things creative, and I also have a heart for encouraging others in their walk with God. 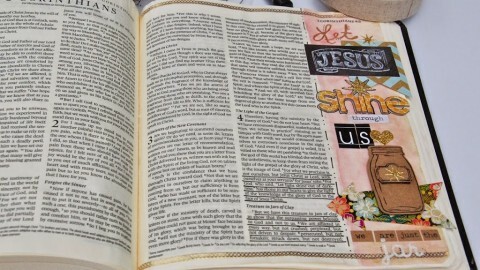 When I discovered Bible Journaling, I was thrilled that I could combine these two passions of mine. 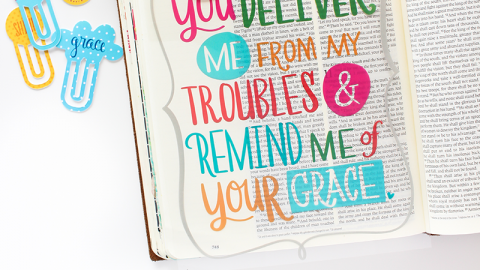 This truly has revolutionized my quiet times with God and has helped me interact with his word in a way I never have before. 1. I start out simply by just reading my Bible. Right now, I’m going through the 365 Days of Truth plan by She Reads Truth and it has been amazing. 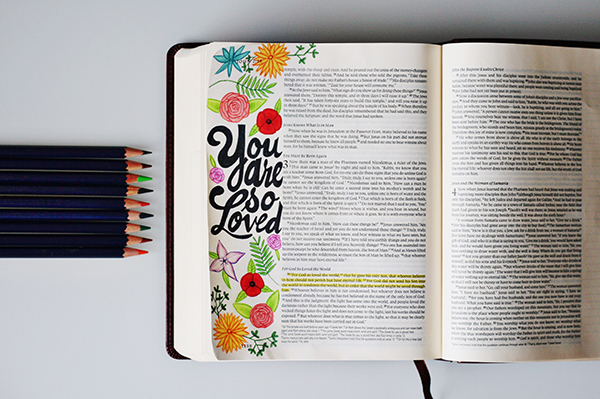 As I’m doing my daily reading, I will highlight or take note of any scriptures that really jump out at me. Once I’m finished with my reading, I’ll go back and choose one of the highlighted passages that truly speaks to me and I’ll start working on that. 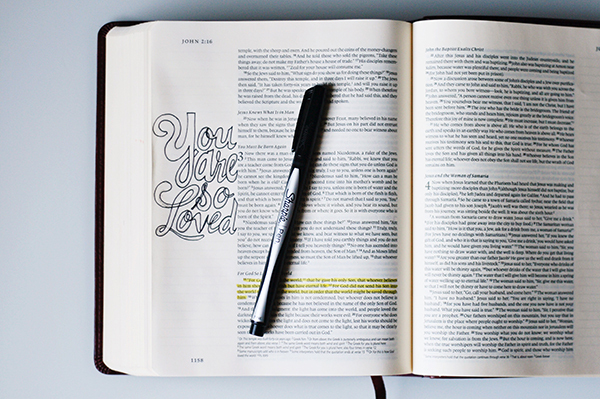 For this page, I chose John 3:16. Most of us are pretty familiar with this verse, but for some reason when I read it this time it stuck out to me even more. 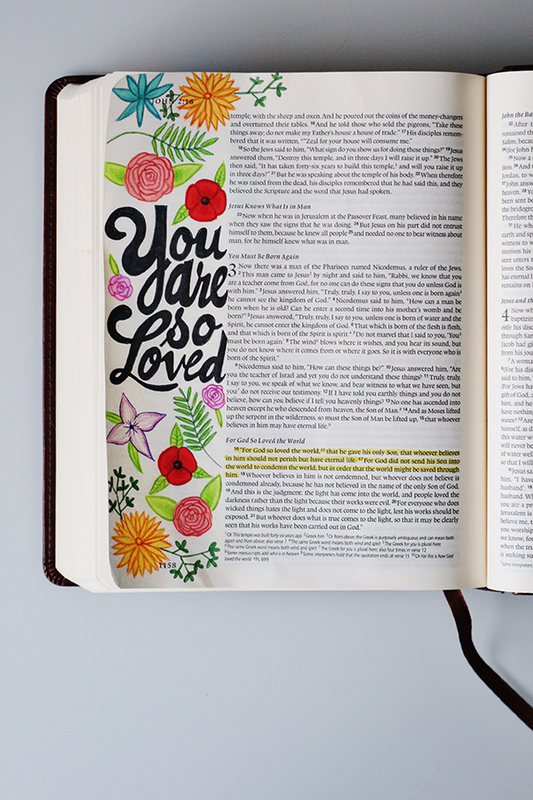 I love how it says “For God SO loved the world…” (emphasis mine) and I believe God wants us to read this scripture in a personal way and know that each of us are truly SO loved. 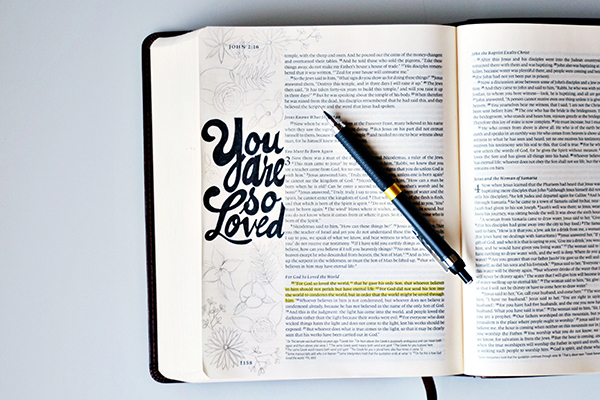 So that’s how I decided on using “You are so loved” for my wording. 2. As I think more on the particular passage I’m working on, often a certain image or combination of colors come to my mind and I’ll use that for the direction of my illustrations for that page. 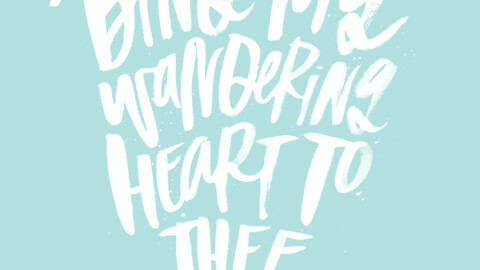 In this case, I thought of a field of brightly colored wildflowers along with a bold script font. 3. Once I know the direction that I want to go, I’ll start sketching out the lettering first so that I know I can fit in all the words that I want to. I always use a pencil first, because you never know when you’ll have to erase and move some things around. (I had to do that a few times here in order to make the lettering not look too cramped). I like having the flexibility of pencil lines before making things permanent with ink. 4. Next I’ll outline and then fill in the letters with my pen. (Note: sometimes I sketch in my illustration as well before doing this…just depends on what I feel like doing that day. Haha.) Here I used my Sharpie pen in black. 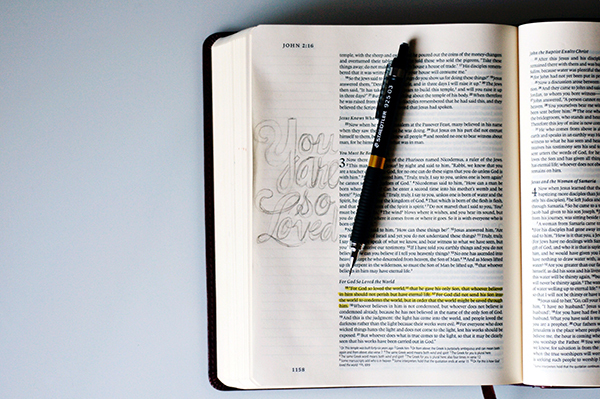 I like this pen because it doesn’t bleed through the thin pages of my Bible at all. 5. To get some inspiration for my wildflowers, I searched “wildflowers” in Google Images and scrolled through to look at lots and lots of images of flowers. Don’t be afraid of looking at photographs, etc. to inspire yourself. (However, if you do completely copy a photo or design, be sure to give credit to your original source). :) Once I was inspired by all the flowery goodness, I sketched in my design using my handy dandy pencil. 7. Once the base colors are down with my markers, I’ll go in and do some shading and detailing with my colored pencils. 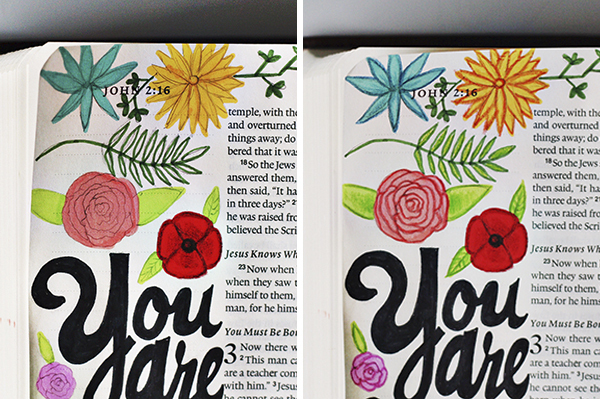 You could leave it with just the markers, but I love how the colored pencils add a sense of depth to the design. Here, I used my Derwent Inktense pencils (I also love Faber-Castell’s pencils!). 8. To finish things off, just erase any leftover pencil marks. Remember to be gentle while you’re erasing, because the pages are fragile. And then, VOILA! You are done! This page was a little more involved and time consuming because of how detailed the flowers were, but I had lots of fun with it! 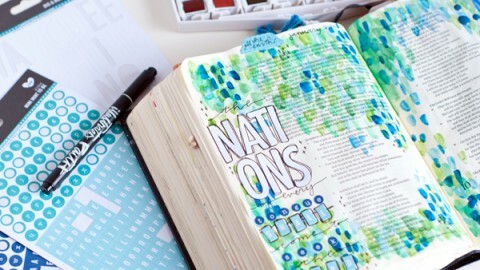 I hope that this inspires you to grab your Bible and go create! Thank you so much Tiffany, I love how you break it down step by step. It really makes it so inviting for anyone! 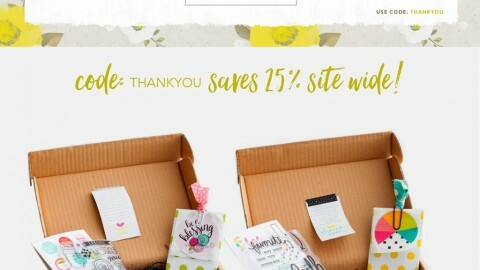 FLASH SALE 2 kits for $36.47 plus free shipping! 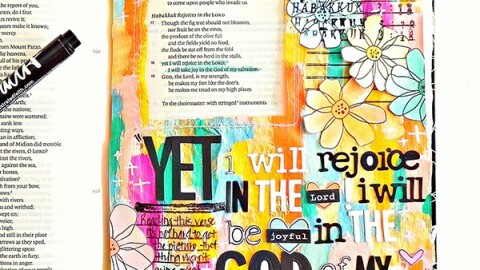 *NEW Bible Journaling Release! * Delight in His Day!!! This is beautiful! Thank you so much for sharing your process. I hadn’t thought to use pencils after marker. Great idea! thank you so much for sharing your process step by step!!! 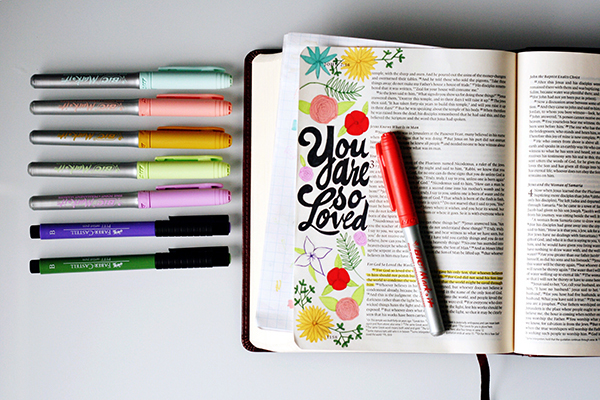 Super helpful for a newbie journaler! What bible do you use for this? With the Margin! I love your work! 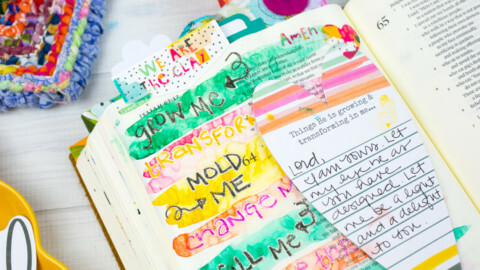 I would love to start doing this!